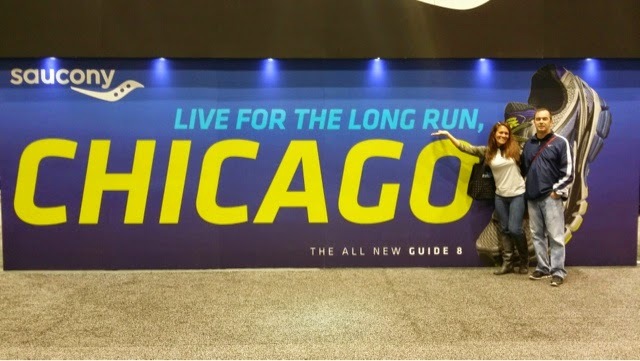 My Chicago Marathon Race Experience. Episode 1. Welcome to my Chicago Marathon Race/Vacation/Experience! 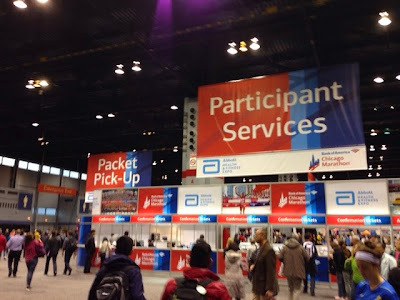 I honestly have no idea how to start this blog post regarding my recap experience of Chicago Marathon. I know there are LOTS of people who have ran this race before and LOTS of people that have ran races much bigger than this one. This was the largest race to date for me and I was just a wee bit overwhelmed. I could really end it right here with...I LOVED EVERY MINUTE and be done with it. But I won't. I will attempt to humor you with the story of my race experience with Coach Plaid Shorts aka my very crazy husband and his first marathon, the never ending pics of the #BubbleGumMoose and the ridiculous amount of Selfies that I took during the race. 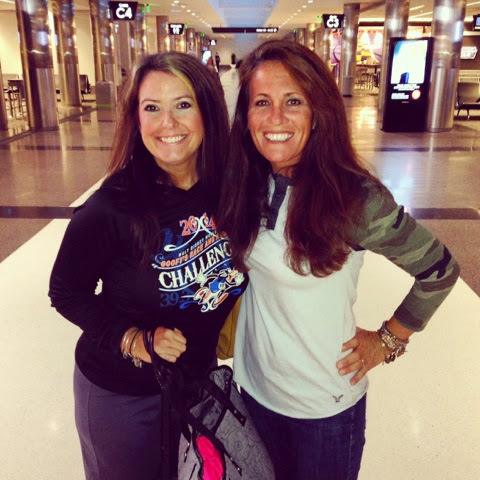 We headed to the airport bright and early to catch the first flight out, and of course, it was delayed but luckily I ran into one of my dearest friends, Leigh who was not running the Chicago Marathon but was instead going as a spectator to cheer on #TeamPlaidShorts and some of our other closest running pals. This girl kept me laughing in the airport for the first couple of hours of my day. Out loud belly laughing. Seriously, Leigh is my roomie for Dopey Challenge in a few months. I don't think we could ever have a bad time! I knew that we were about to have a fun weekend. About our flight...when my hubby suprised me with a surprise trip to NYC a few months ago, he booked our trip on Priceline.com. Overall, he did a FABULOUS job with our hotel and travel arrangements. He's definitely not a travel agent, but he tried and that's all that counts. You can read my review of my NYC trip here. The trip was great but the flight was just AWFUL. We were booked on United Airlines and I swore then that I would never fly anything but Southwest Airlines again for a very long time. Southwest Airlines is definitely not the most luxurious airline out there but really, it's quick. And It's easy. I can almost always book a direct, hassle-free flight. And NO, Southwest Airlines is not paying me to say this. I'm just a total fan and I've not had any major issues with them. EVER. I can check 2 FREE bags per me. Do you hear me?? I'm an overpacker. That $25 per bag with United Airlines....yeah, you can keep that. I can even deal with my little bit of a flight delay on this trip. So needless to say, I made all of the travel arrangements on this trip and I wasn't in a hurry. So we made it onto our flight, I snoozed hard for a couple of hours and then we landed in beautiful Chicago. Oh hey cold weather. #WhereDidYouComeFrom? So hubs is on a mad mission to get to the baggage claim. Typical Male...Always on a mission. Problem--we don't have our luggage. Solution--go immediately to baggage claim. Gotta make good time. No stopping. Freak in the airport. 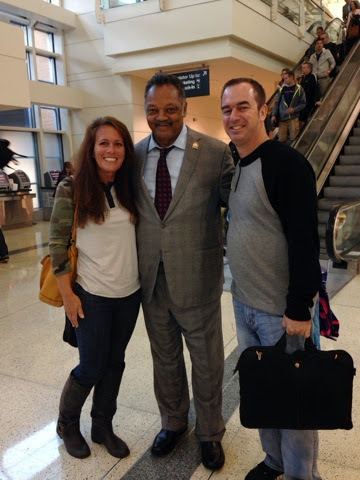 But before we make it to the baggage claim, I spotted Jesse Jackson on the escalator. Hold up.....Let the shenanigans begin. Now, am I really a fan of everything Jesse Jackson believes in and talks about? No. 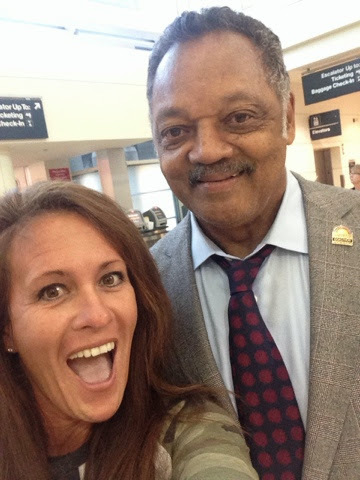 But have I prayed with Jesse Jackson before in downtown Birmingham. Yep. Am I about to get a selfie with him with the I've-Been-Sleeping-So-Hard-With-My-Mousth-Open-On-A-Plane-Look?? Absolutely. My Husband is not amused. LOL. And I made him get a picture with Jesse Jackson too. Even Better. Christmas Card Material! Jesse Jackson in the house! 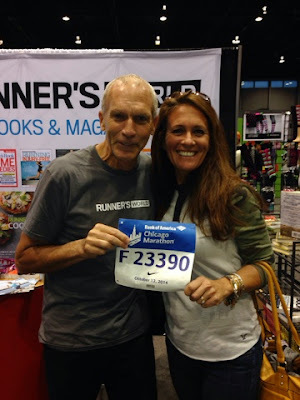 Checking In....Rewind for a moment back to the Spring when I first learned that my husband and I were accepted into the Chicago Marathon. 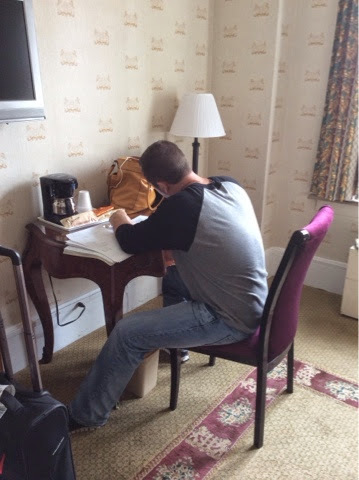 From the moment that I got the email (I got my husbands' early that morning and mine late in the afternoon), I started researching hotels with close proximity to the Start/Finish Line of the marathon. To this day, I will say that was probably one of the smartest things that I ever did. I knew that I would be okay to walk a few blocks but I also knew that my husband would do better staying super close by. I immediately booked the Congress Plaza Hotel which was right across the street from Millennial Park (Home of the Chicago Marathon). 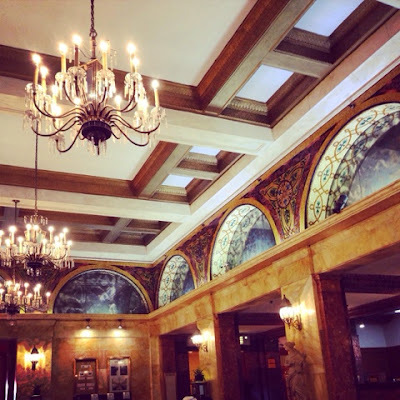 The gorgeous lobby and chandy candy at Congress Plaza Hotel. OMG. 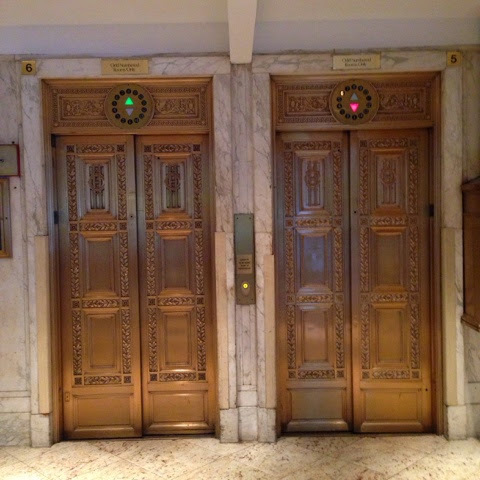 These elevators are beautiful! Loved all of the detail in the hotel. 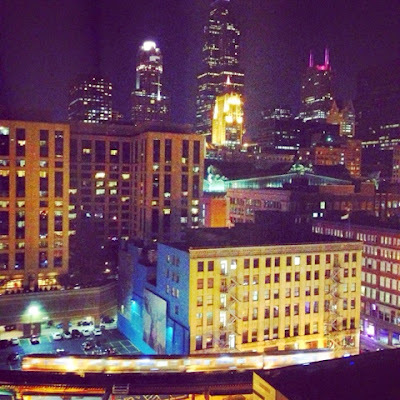 The other option that I was leaning heavily toward was the Hilton (Downtown Chicago location). The next time that I run Chicago Marathon...and I say next time because I WILL run this race again, I will consider staying at the Hilton. Don't get me wrong, Congress Plaza was GORGEOUS. It was old. It had charm. It was very close to the race. Rooms with a race/park view were even available. 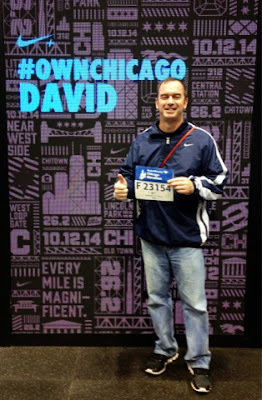 However, the Hilton was Chicago Marathon Headquarters. Home base. The inside lobby was decked out for the race. 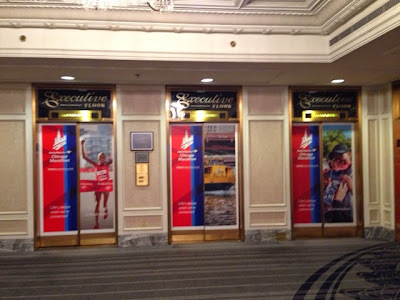 Heck, even the elevator doors had scenes from previous Chicago marathons on them. At the end of the day, for financial reasons, I went with Congress Plaza. It was almost $100 cheaper per night. I loved the elevator doors but not for $100 more a night. I'm completely satisfied with my choice. 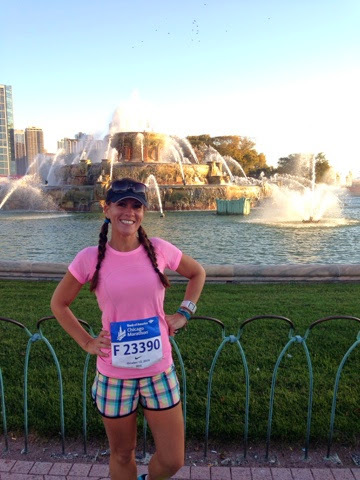 I had friends who stayed at the Hilton and I even ate dinner there one night instead of going out on the town but Congress Plaza Hotel was my home away from home for the three nights that I was in Chicago for the marathon. The lobby elevators in the Hilton Downtown Chicago. #BubbleGumMoose....From the lobby, to the room, to my view....everything was just perfect. I decided not to go with the marathon race view from my room. After all, it was $15 more a night for that view. No way. That's a whole lot of Chicago Pizza that I could eat instead! THANK GOODNESS I didn't. My view from room was fabulous and I would have never fallen in love with #BubbleGumMoose. How crazy is that?? I fell in love with a moose. A moose that blows bubbles. From bubblegum. On the side of a building. What's happening here?? The view from my room at Congress Plaza Hotel. Another thing that I really enjoyed was that we opened the windows half-way and let the cool air in. I heard the trains, the taxis, the city. I do not hear that where I live at night. If I opened my windows, I would hear birds chirping, crickets and frogs. And quiet. I hear lots of quiet. Living in Alabama is peaceful and not near as fast-paced but I like to hear the city when I'm in the city. If I look out my window, I see trees and I see my neighbors' porch lights but I definitely don't see people walking around on the sidewalks, see cars below my window, big buildings and bright lights. The #BubbleGumMoose was slapped in the middle of the city madness. He was a treat for me and I loved him. 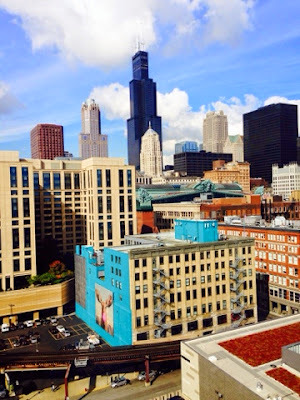 SOUTH LOOP — The South Loop's galleries, performers and artists will explode onto Wabash Avenue Friday for the annual Wabash Arts Corridor Crawl. 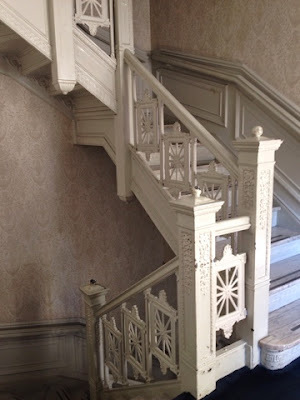 The free arts and culture walking tour runs from 4-9 p.m., beginning in the first floor lobby of 623 S. Wabash Ave. and leading visitors through 12 galleries down Wabash Avenue from Van Buren Street to Roosevelt Road. Along the way, dance performances, concerts and pop-up food and drink stations serving local fare will entertain viewers to celebrate the start of Columbia College's new school year. The showcase also celebrates the ongoing partnership between Columbia College Chicago and other South Loop organizations hoping to revitalize the Wabash Corridor as an arts destination, an initiative backed by Mayor Rahm Emanuel, who called for more installations in the neighborhood over the winter. "I have seen firsthand the power the arts can have to transform a neighborhood economically and well as culturally," he said in a statement. 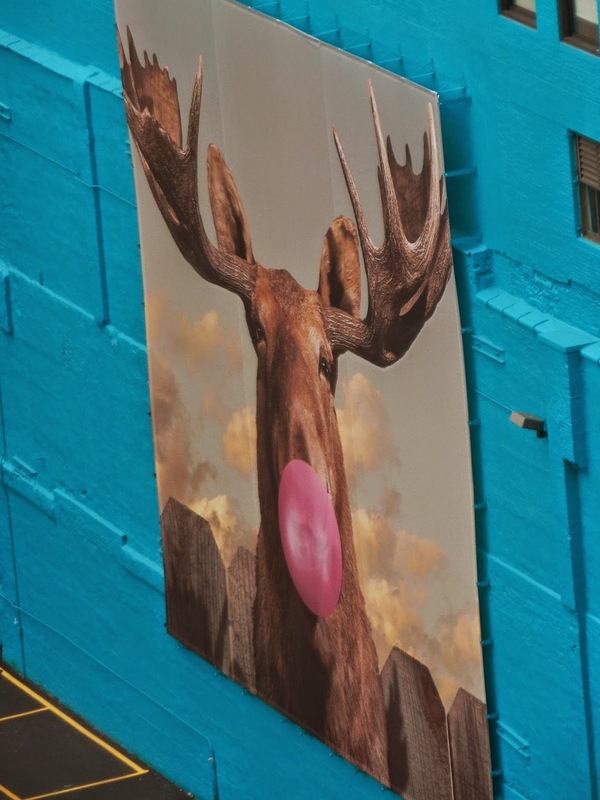 Highlights of this year's crawl include a nearly 50-square-foot photographic banner titled "Moose Bubblegum Bubble" that hugs the south exterior wall of Columbia's 33 E. Congress Parkway building and jazz performances at Buddy Guy’s Legends. On to the Expo.....We took a 15 minute shuttle ride from the Hilton to the The Abbot Health & Fitness Expo. It was definitely not within walking distance from our hotel. Once we arrived, I was prepared for mass chaos. It was the total opposite. The expo was HUGE but so well organinzed. I could tell that this was not their first rodeo! 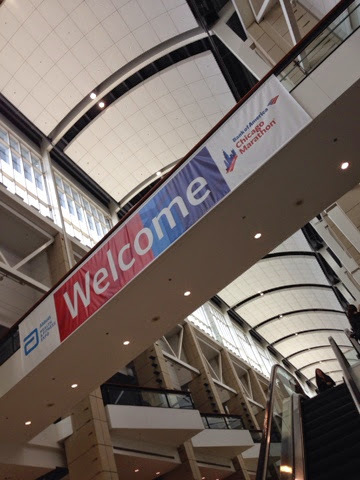 Welcome to the Bank of America Chicago Marathon Abbot Health and Fitness Expo! HUGE signs everywhere to point you in the right direction. Sorry for the blurry pic but the packet pickup booths were basically empty. No lines...and this was around 4pm. I was shocked! 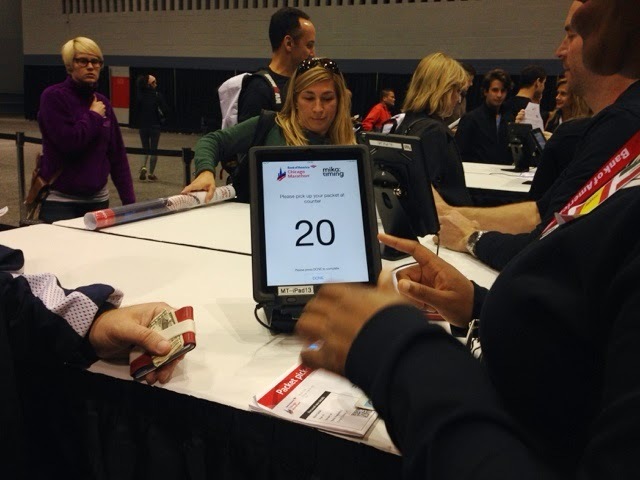 Once the QR Code on our packet pickup ticket was scanned, we were informed on the iPad which number booth to go to. 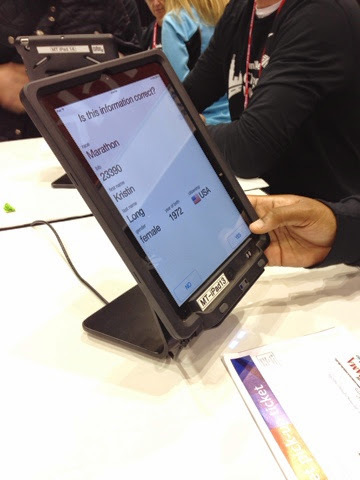 Once we got to that booth, the volunteer had already gotten notification and pulled our packets out and had them waiting for us. No lines. No waiting. No books to flip through to find our names....GENIUS!! This was a feature that other races whose names shall remain anonymouse need to adopt. First stop. My packet pickup QR code was scanned and I had to verify that the information was correct. 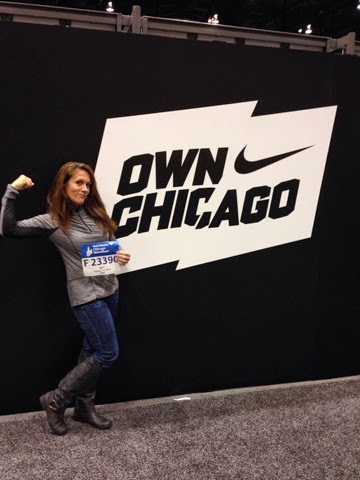 Female from the good ole USA running the Chicago Marathon. EEEEK! 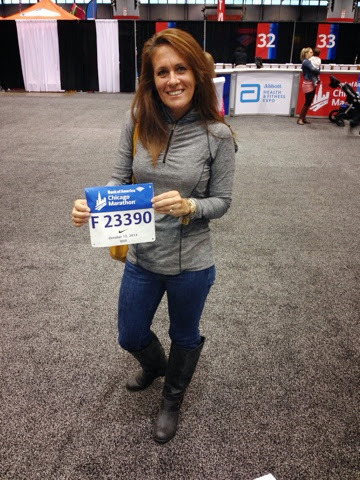 Got my bib....super proud moment for me. I'm feeling like a BIG TIME Marathoner. We got our bibs from Participant Services and then headed out to have a little fun and do some shopping! The Nike booth was just one of the coolest. Lots of photo opps....The technology was super cool. 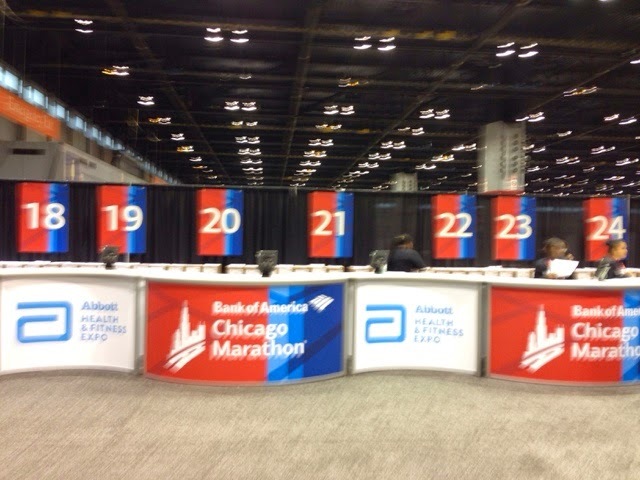 We could scan our bibs and then our names and different logos would come up on the screen behind us. he hates taking pics so this is a rare moment. Since Nike is one of the official sponsors of this race, their logos were everywhere! I think we visited almost every single booth...Some of my favorites? Nike, Brooks, Runner's World. My husbands favorite?? 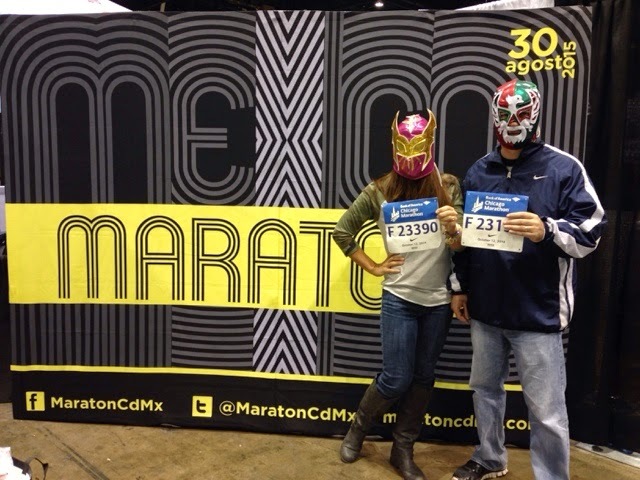 The Mexico Marathon booth. Anytime he can make me wear a Mexican Wrestling mask....he does! Crazy man. 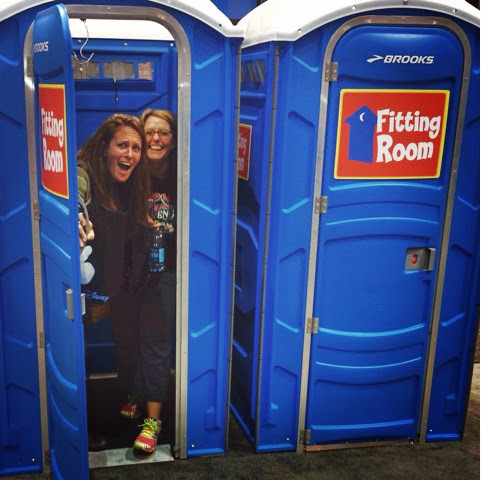 Stopped by the Brooks shopping area and the fitting rooms were porta potty's, clean of course. It's always a good day when I get to chat with Bart Yasso. 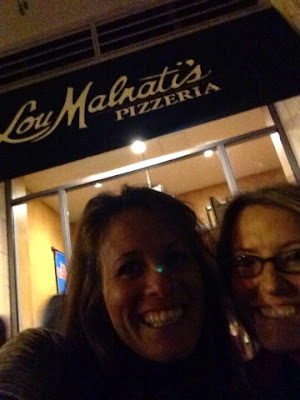 Somehow we started talking about his marathons from 20+ years ago...and pizza. 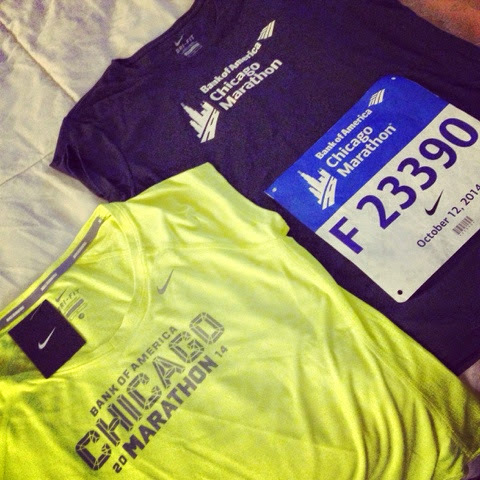 My event shirt and Nike Shirt from the Expo...believe it or not, that was all that I bought! There was just so much to choose from that I couldn't make any rational decisions so I didn't buy anything else. I do have severe buyers remorse about not buying a long-sleeve shirt or a jacket. #LessonLearned. Live for the LONG run...hehe. 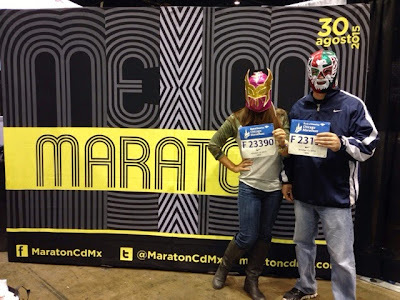 Here we are in all of our Mexican Wrestling Mask glory. Bring on the Pizza.....After the expo, we were all starving! I must have asked 50 people before I went to Chicago, "Where is your favorite place to eat pizza in Chicago?" Probably half of my answers were "You HAVE to eat at Lou Malnati's". So of course with numbers like that, I had to. One word. DELISH. Lou Malnati's was only a couple of blocks away from our hotel so we walked over. We waited for about 45 minutes for our table and then our pizza came not too much longer after we sat down. We pre-ordered our pizza while we waited. Lifesaver. I'm sleepy, hungry and delirious at this point in the night! 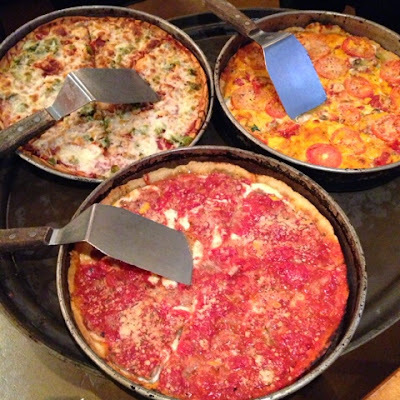 Operation: Eat All the Chicago Pizza. Welcome to my Protein Milkshake Bar Review! 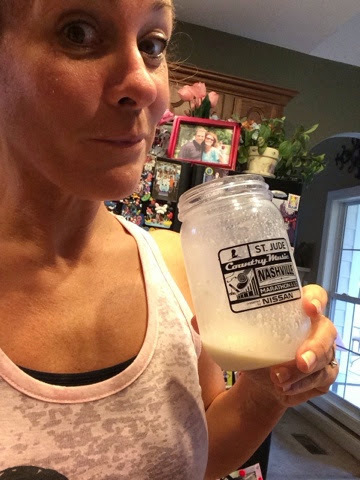 In my never-ending quest to find the perfect protein shake, today I tested out Protein Milkshake. 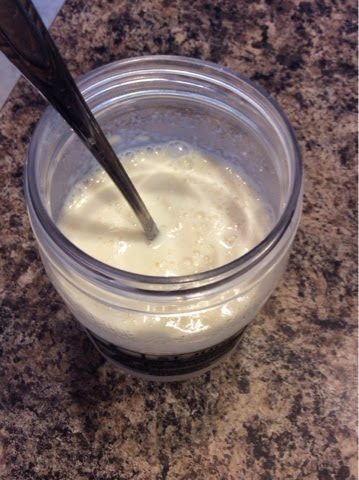 As with every other protein shake that I try, I am most interested in the Vanilla or Chocolate-y type flavors and like to mix my protein powders with straight up Vitamin D whole milk. That's what my kids drink. That's what I drink. The mission statement of this company?!? "We Fuel Women Who Change The World". So far, I'm liking this. I was able to choose which flavor from the Protein Milkshake Bar that I wanted to try so I chose Ice Cream Sandwich flavor, a mix of both flavors that I like. Sounded yummy to me. However, I received a one-scoop sample of Cream Puff Flavor in the mail from the company. Ummm okay. I'll still try it but why let me choose if you're just going to send me what you want me to try?? As with anything, I am ALWAYS very thankful for any gift that I receive, just thought it was just a little strange. That's all. Rich in leucine, our whey protein can aid in efficiency burning fat, increasing your metabolism, reducing hunger cravings and aid nourishing your body with all 8 essential amino acids. 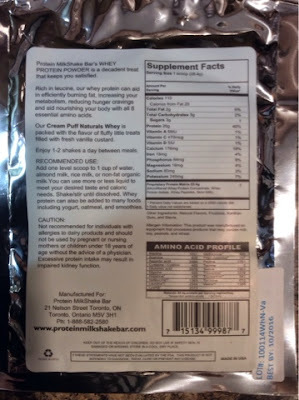 Nutritional Label on the back of the sample. Overall, I really liked the Cream Puff flavor Protein Milkshake and would recommend it to my running friends. It was not chalky-tasting AT ALL and it really did taste like a milkshake! I'm also a total fan of 3g of carbs and 110 calories. I'm sure mixing it with whole milk added a few more calories but I'm okay with that....I'm a fan of whole milk. My runner bones need the Vitamin D.
For more information on how to order your favorite dessert flavor, please visit ProteinMilkshakeBar.com. 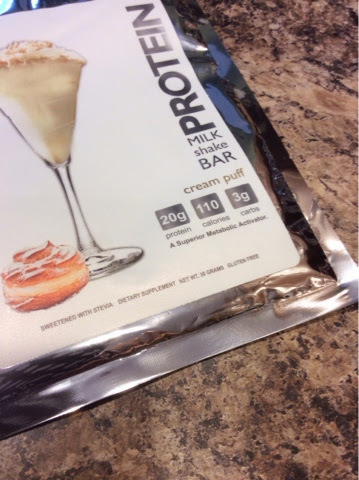 Disclaimer: I received a sample of Protein Milkshake Bar in exchange for my honest product review. 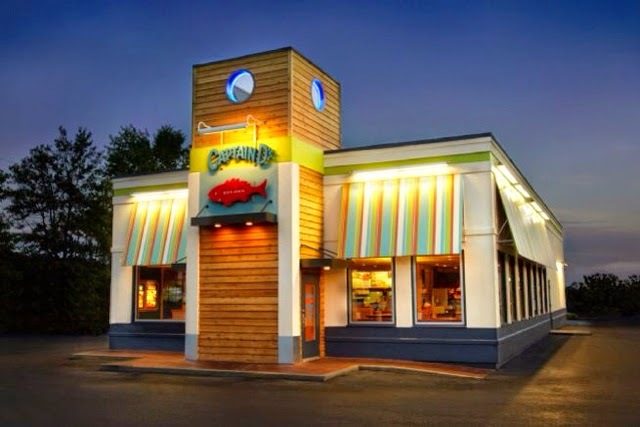 The fresh new look of Captain D's Restaurants! 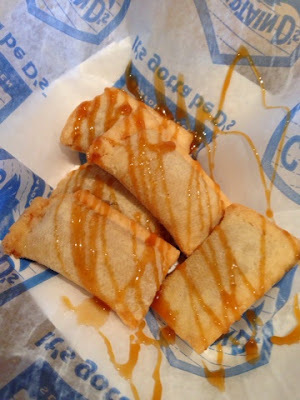 When I was contacted by Captain D's and my good friend, Sami Cone to attend a Birmingham Blogger event to try out a few new items on their new healthy menu, my first instinct was not NO but HECK NO. I do not eat fast food and I don't want to pretend like I do. However, after receiving a few emails describing their new look and vision behind the menu, I decided to give it a try. I'm glad that I did. Hanging with Nashville's own, Sami Cone! I will be brutally honest when I say that I cannot remember the last time that I ate at a Captain D's. It wasn't because I don't like their food...I mean, the fried fish smothered in malt vinegar is delicious. You know that it is. I'm NOT denying that. There is a Captain D's within 15 minutes of my house also, so location is not the issue either. It's just that after a bad health scare a few years ago, I swore off all desserts, junk food, fast food etc. I run to stay in shape and to stay in good health so the LAST thing that I'm going to do is cancel all of my hard work out and eat unhealthy. It's not going to happen. I'm a realistic person and I realize that every once in a while I'm going to have to hit the fast food drive-thru...I have three kids. They play sports, we're never home during certain seasons of the year. I live at ballparks. Nachos become dinner some nights and rive thru windows sometimes cannot be avoided. If I have to swing thru, I always choose the salad, something grilled, yogurt, oatmeal....you get the idea. 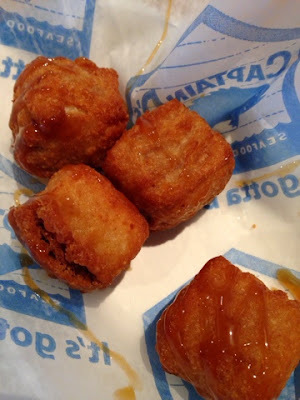 Now I was REALLY interested to see the new items presented by Captain D's. First off, I was welcomed by the PR crew from Nashville. They came all the way to Birmingham to hear my thoughts and to see what my kiddos had to say. I think that all around we were pleasantly surprised. 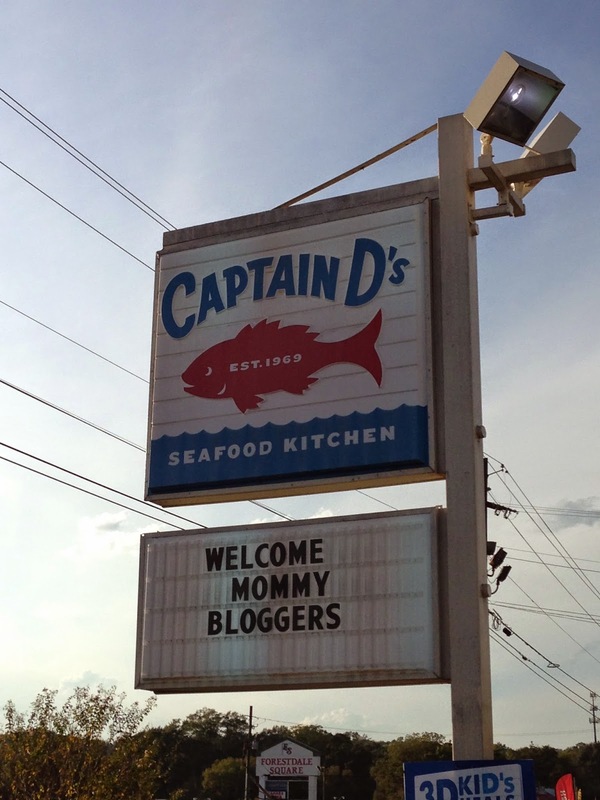 The Captain D's PR Crew giving the Birmingham Bloggers a warm welcome! Emily Tucker, Sr. Manager of Field Marketing, informed us that they were changing the brand, changing the "look" of the store inside and out. They want the look to have a more coastal, comfortable, brighter and beachier look. They have definitely succeeded. I was shocked when I walked in. It definitely did not look like the old Captain D's. I can remember as a kid thinking...."Ahhhh if I could EVER just learn how to tie one of those knots". Do you know what I am talking about?? Captain D's as I remember it was decked out in Fisherman knots. I will never forget that. Big Giant Thick Rope Knots EVERYWHERE. 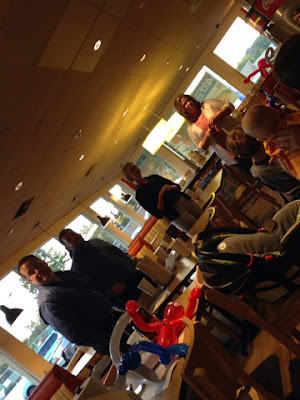 Families can sit down at Captain's tables in the middle of the restaurant that will accommodate a family of eight. That is HUGE! I know that there are six of us in my family and we struggle with that. We usually always split up at a fast food place. The booths just don't cut it. 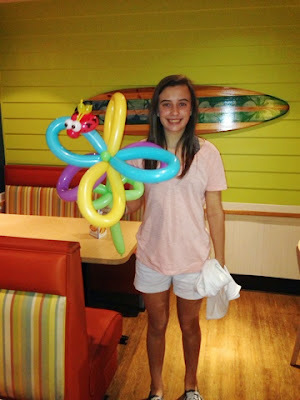 Even if dinner happens at a fast food restaurant, it's still a priority for me for my family to all come together at the end of the day for a good meal. I have always been a big believer in families eating together all at once. 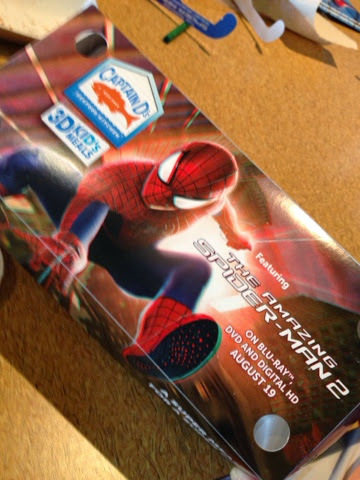 Next on the Brand Team, Sam Brenner, gave us the inside scoop on the new "SpiderMan" themed Kids Meals. The goal on this new design was to figure out a way to draw kids in and then also offering them healthy options in their meals. Each Kids Meal will include two healthy sides. 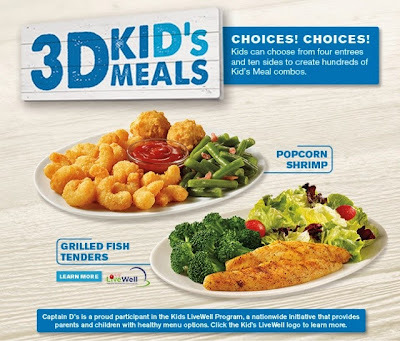 My kids ordered green beans, mac n' cheese and grilled fish. They loved it! 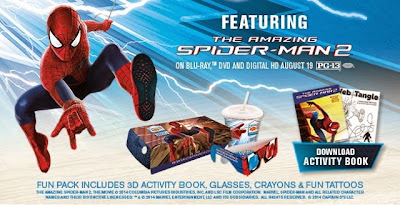 Each Kids Meal comes with 3D glasses, downloadable activity books, crayons and tattoos. 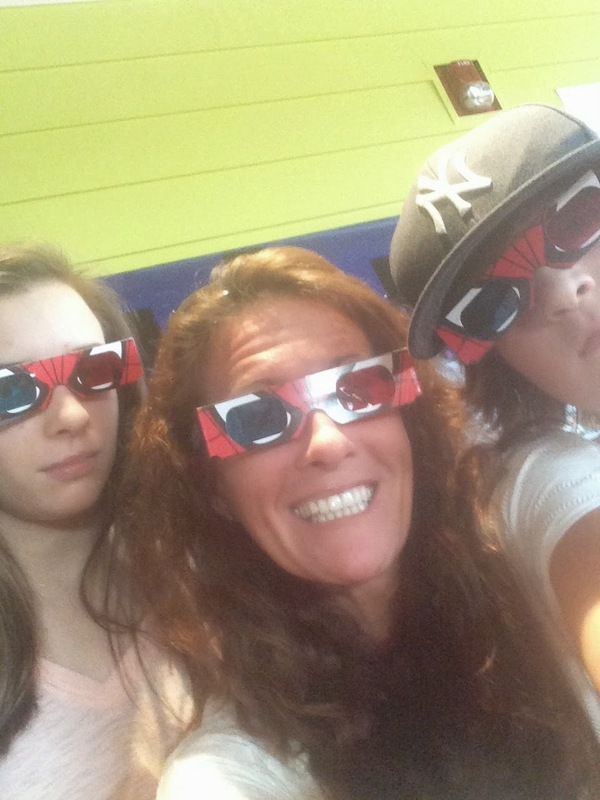 My kids are not impressed with my shenanigans. LOL. 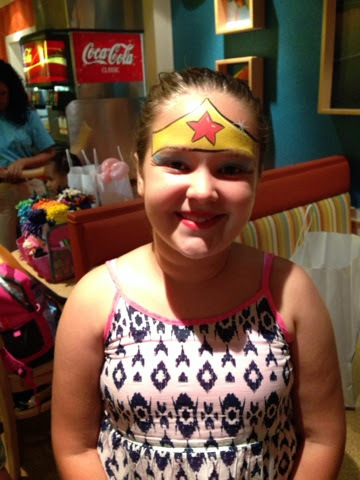 Sami Cone's Daughter transformed into Super Woman! Perhaps the biggest kid of the night....was yours truly! 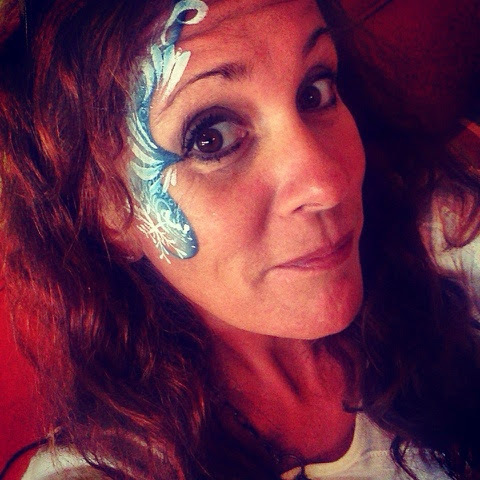 I did not hesitate at all to get my face painted...Once a Princess, Always a Princess! 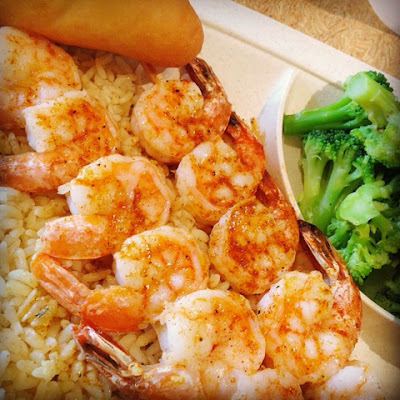 As for me, I ordered the Grilled Shrimp Skewers with seasoned rice and steamed broccoli. My dinner came with a roll. 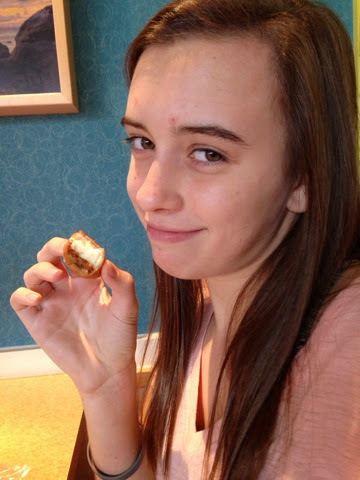 However, I did not eat the roll. I'm sure that it was yummy but I kept my dinner under 500 calories. Can you believe that?? 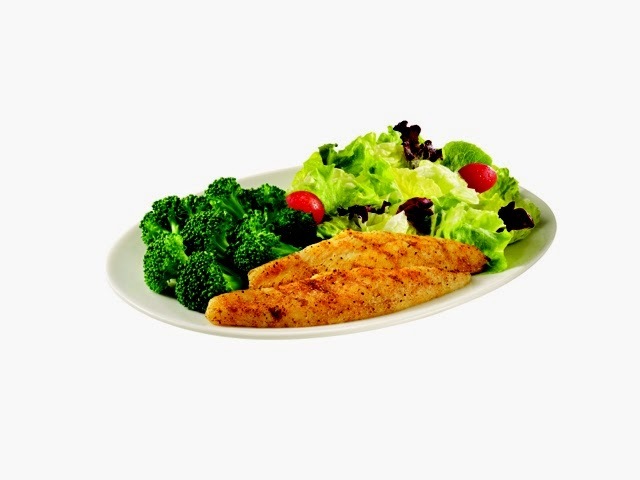 An affordable grilled seafood dinner at a fast food restaurant for less than 500 calories?!?! I was more than impressed. The shrimp was delicious too! My Dinner...Grilled Shrimp Skewers, Seasoned Rice, Steamed Broccoli. 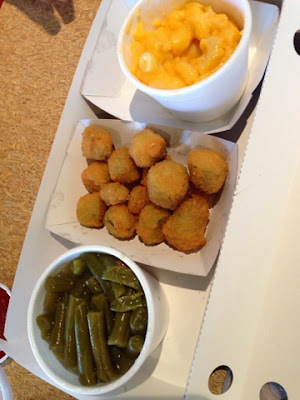 I was only able to try out one dinner tonight but I will definitely make a better effort from now on to visit Captain D's when my family needs to grab a quick dinner on the go. 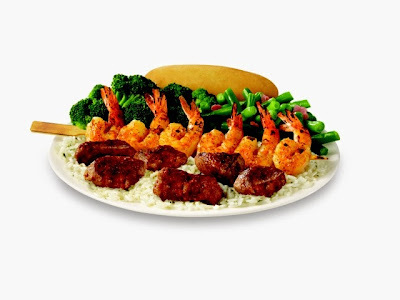 Surf and Turf served with seasoned rice, steamed broccoli and fresh roll. Grilled Fish, Steamed Broccoli and Salad...less than 500 calories! My son eating dessert with his not-so-serious face! and yes, I'm really taking her picture! 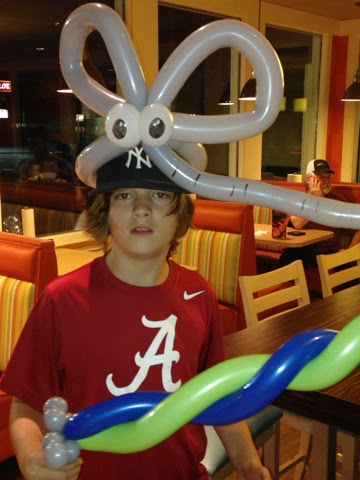 Be sure to stop in to your local Captain D's and check out their fresh new look! I think that you and your family will be just as impressed as I was! And for all of the latest news, updates and additional menu items available, be sure to visit CaptainDs.com. Also, follow @CaptainDs on Twitter, @CaptainDsSeafood on Instagram and follow the hashtag #DsNewLook. Disclaimer: A Huge THANK YOU to the Captain D's Crew and to Sami Cone for inviting myself and my family to discover Captain D's New Look. We enjoyed our dinner and will definitlely be back. 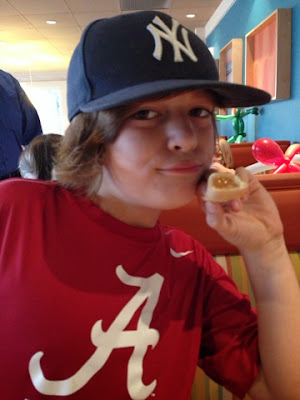 My family was provided dinner and a Captain D's Gift bag in return for my Social Media coverage of the events and my honest thoughts and opinions.